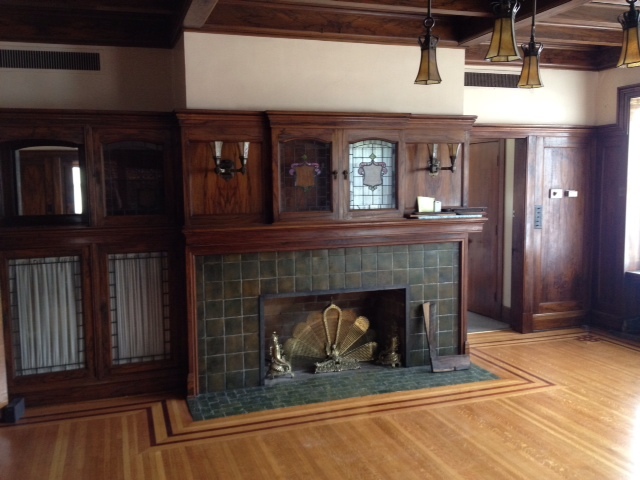 This spring I was asked to do a small restoration job in the dining room of an amazing old house. 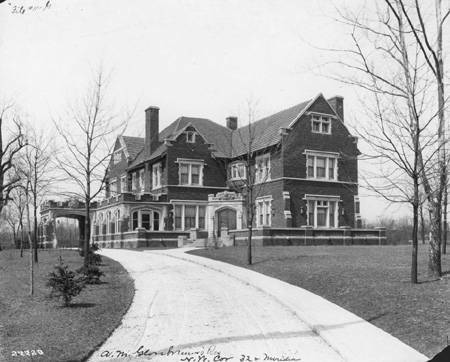 The 7,500-square-foot Glossbrenner Mansion, now owned by the Indiana Landmarks Foundation, was built between 1908 and 1910 for the Glossbrenner family of Indianapolis: Alfred, Minnie, and their three sons. Among his varied business pursuits, Alfred Glossbrenner served as president of the Levey Printing Company, which produced publications for banks all over the world at a time when publishing had the potential to be distinctly more lucrative than it does today. Sic transit gloria mundi. Mr. Glossbrenner hired English architect Alfred Grindle to design this house on Meridian Street just north of Fall Creek in Indianapolis. 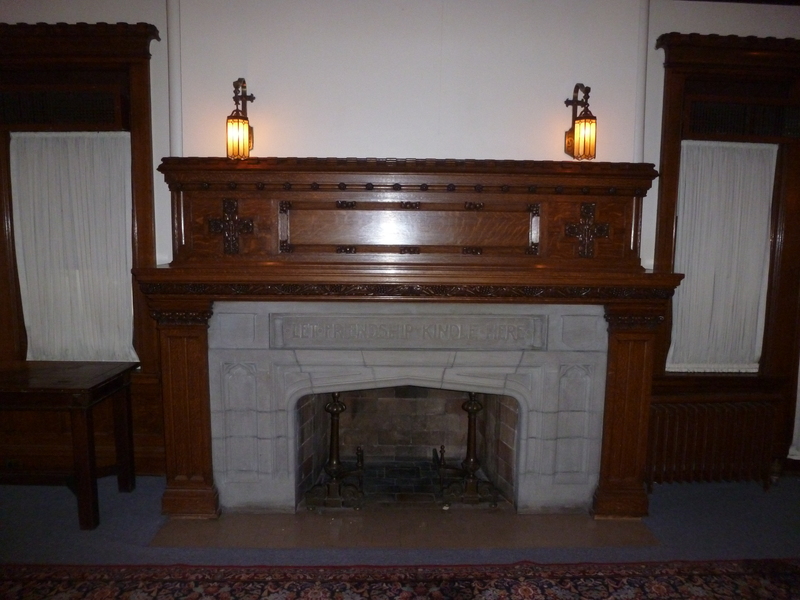 Even today, over a century after its construction, the ground floor features stunning woodwork, a majestic carved limestone fireplace, and many original light fixtures. 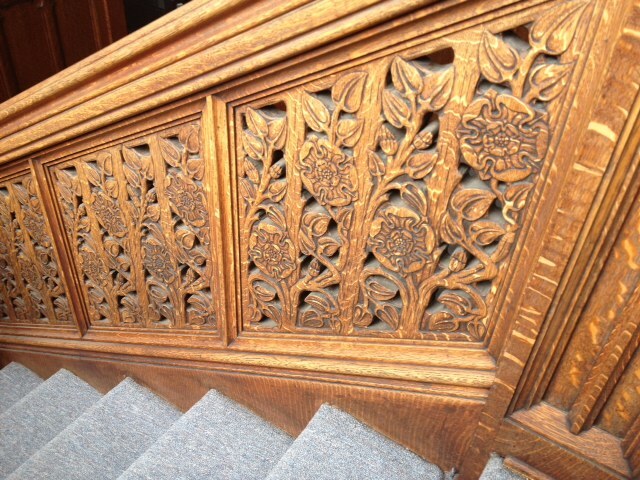 Mrs. Glossbrenner’s father is reputed to have been a lumber merchant, which may help to explain the lavish oak and walnut panelling throughout the public rooms on the ground floor. The dining room is panelled in Circassian walnut and features a tiled fireplace, a short section of built-in cabinetry, and a walnut-veneered coffered ceiling. When Mr. and Mrs. Glossbrenner entertained, they welcomed guests at the front door and led them through a formal entry into the dining room through a pair of pocket doors. No plain, utilitarian pocket doors, these, but a meticulously crafted set veneered in quarter-sawn oak on the foyer side and Circassian walnut facing the dining room. 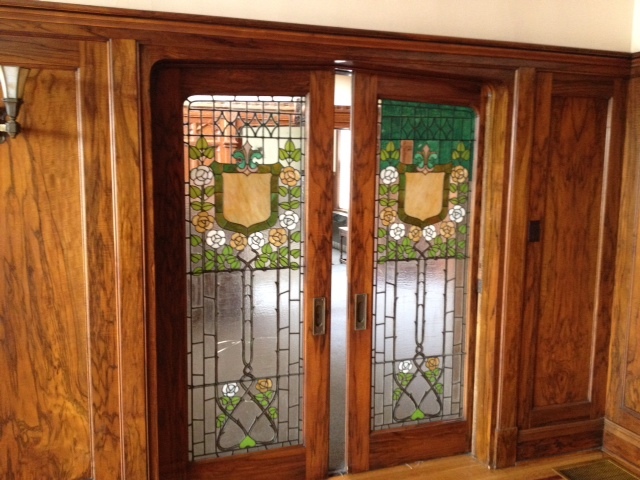 Each door is fitted with leaded glass, and the two doors come together at the center of a Tudor-arched opening. 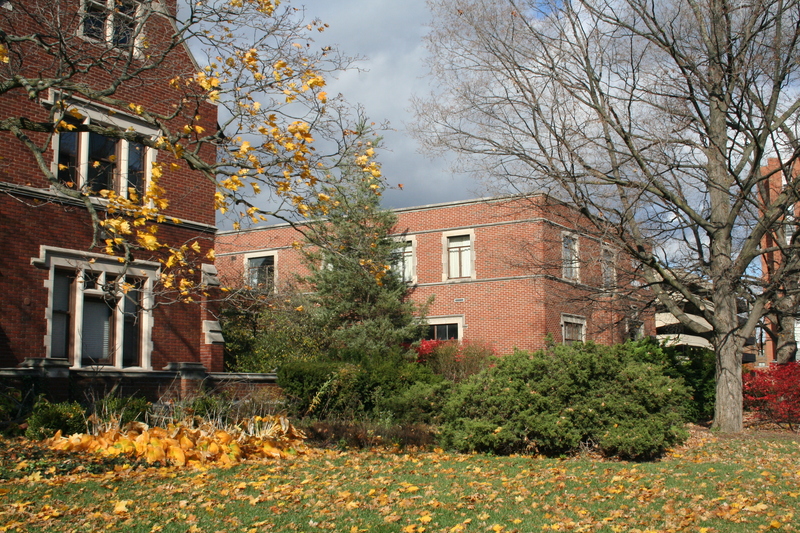 In 1949, the widowed Mrs. Glossbrenner sold the property to Dr. Joseph Walther, who used it to house his medical practice. Dr. Walther made a number of modifications, most of them either sensitive to the original character of the house or easily reversed. Among these were a pair of built-in bookcases that he had installed when he turned the dining room into an office; one bookcase was built between the windows on the north wall, the other in the room’s formal doorway. 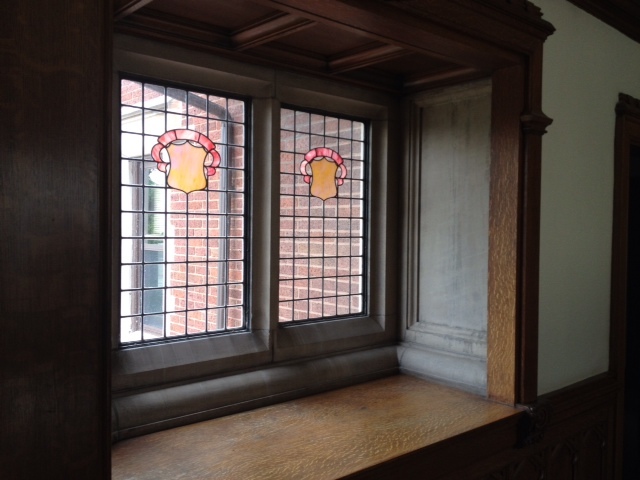 The doorway bookcase was fitted into the door opening with impressive care, the leaded glass doors closed so that patients, staff, and other visitors to the building could admire the doors’ beauty from the foyer. But what to do about the awkwardly shaped Tudor arch above the bookcase on the dining room side? 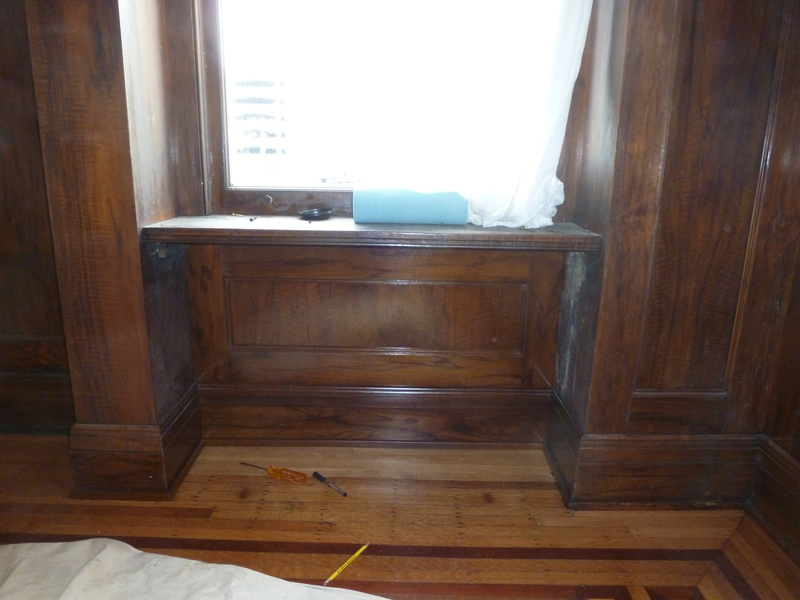 Dr. Walther had his carpenters craft a plywood panel, copying the room’s original woodwork as closely as they could. 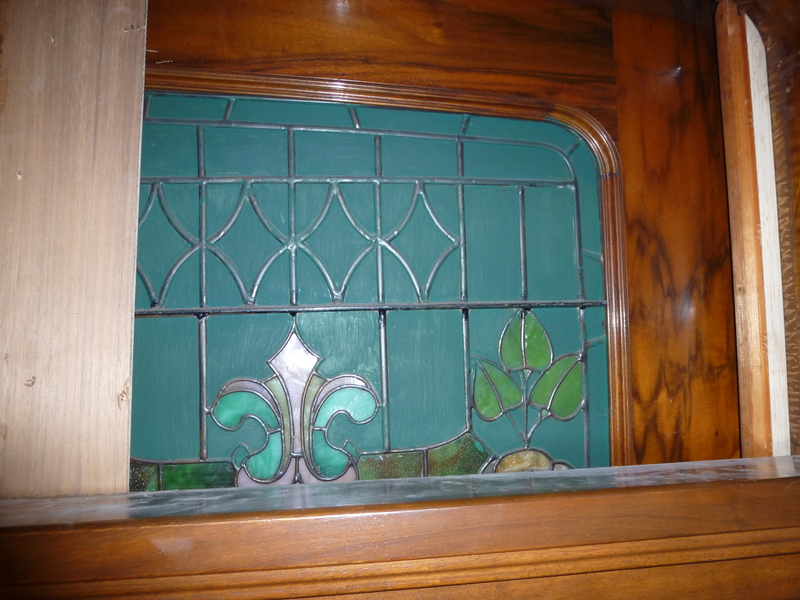 To prevent the wood grain on the panel’s back from being visible through the leaded glass door, he had the clear glass painted green, an ingenious, if odd, solution to the minor aesthetic problem. So successful was this trick that I did not even notice it until after my helper and I removed the panel, whereupon the sunlight coming through the glass from the north-facing window in the foyer made the brush strokes visible. The doors are finally opened after half a century. 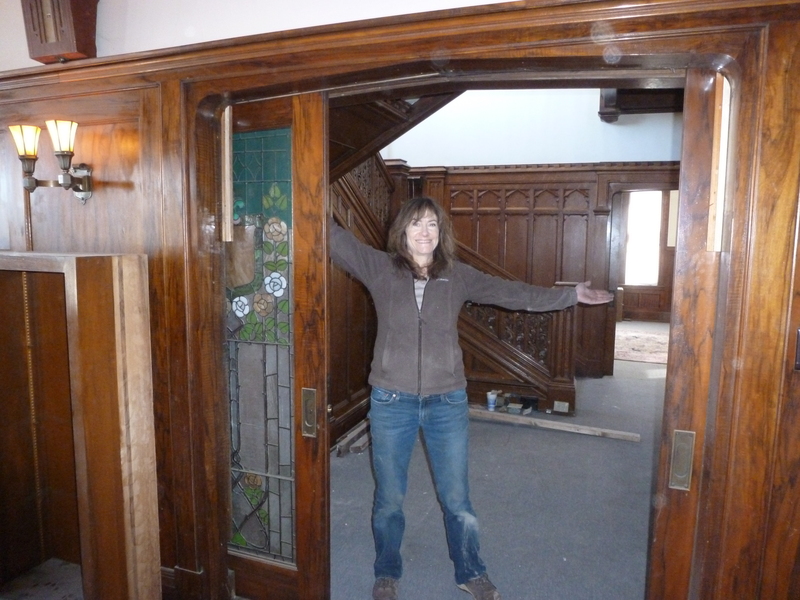 This view is towards the foyer, which is panelled throughout in quarter-sawn oak and topped with Tudor arches. Sunlight streaming through the liberated pocket doors reveals their original glory. 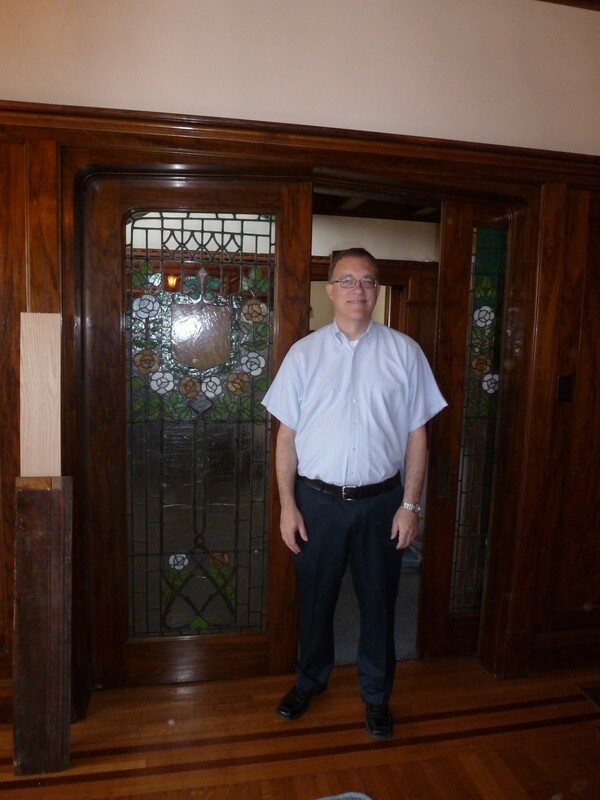 Indiana Landmarks Vice President Mark Dollase painstakingly cleaned the paint from the door on the left the night before an open house. 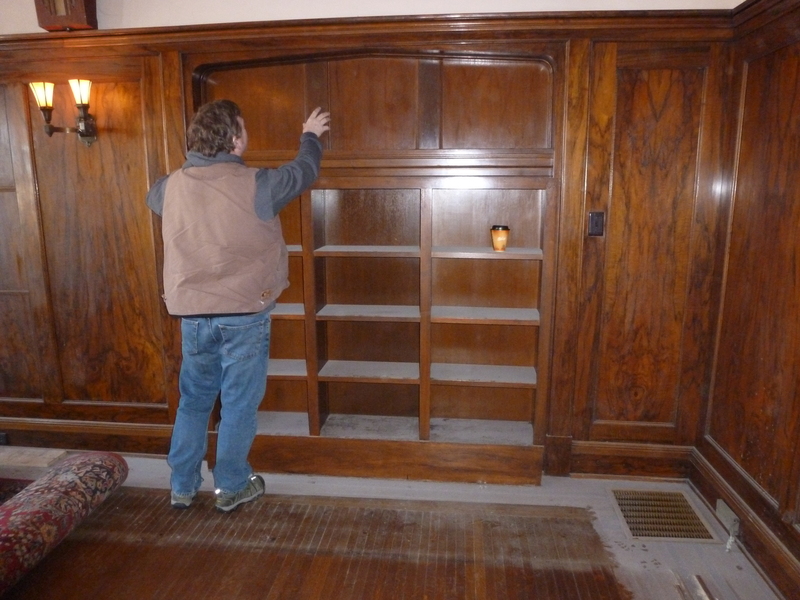 After removing the built-in bookcase, we made some minor adjustments to the doors and were stunned by how smoothly they operated after so many years. I had the dining room-side door stop reproduced by Indiana Hardwood Mills, basing the profile on one of the pieces cut short when the bookcase was built in, and finished it to match the original trim as closely as possible. When we removed the second bookcase–the one on the north wall–our appreciation of Dr. Walther’s care was deepened; instead of having his electricians rewire the original outlet near the floor, he had had them run an extension to a receptacle fitted in the base of the new bookcase, which made removing the bookcase a cinch and allowed us to “restore” the original receptacle without doing a thing. 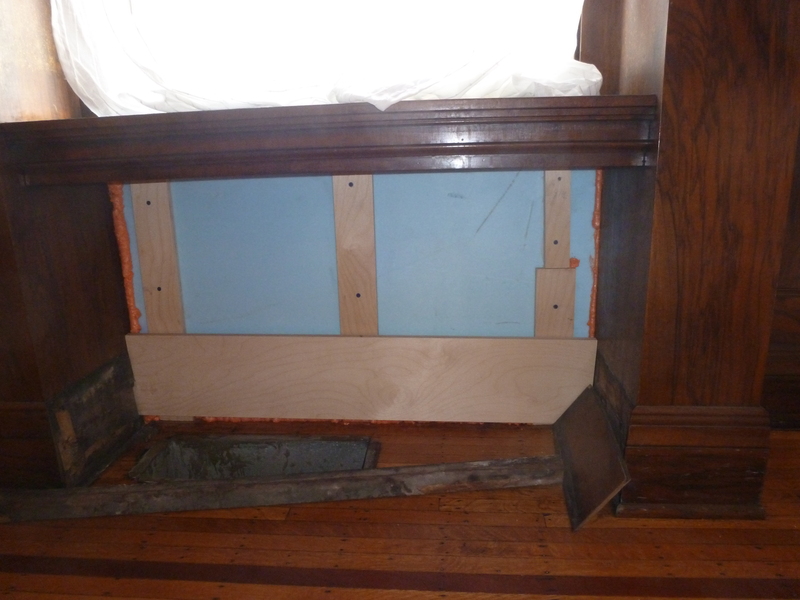 The cavity behind the “new” alcove bookcase’s baseboard, as seen from above with the bookcase itself removed: Instead of hard wiring the receptacle at the front of the added bookcase, Dr. Walther’s electrician supplied the receptacle with power via an extension cord. 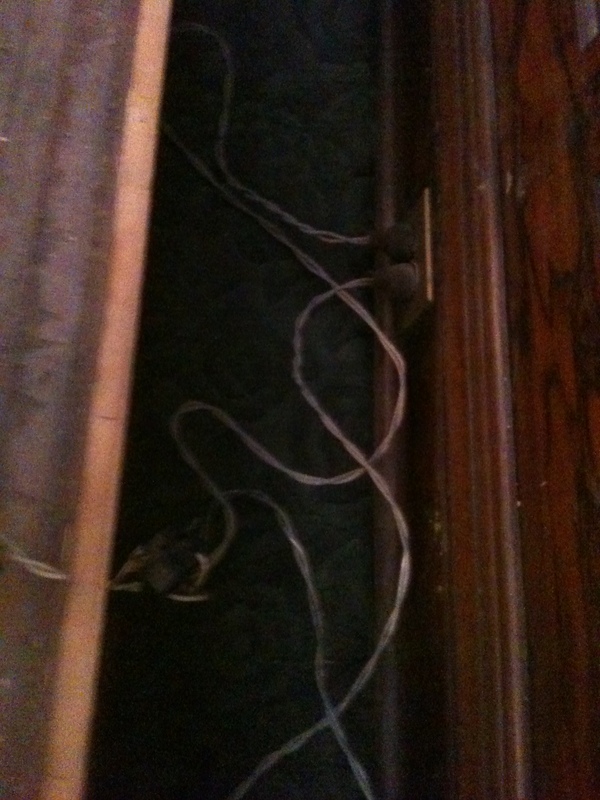 This allowed us to remove the bookcase without involving ourselves in any electrical work. 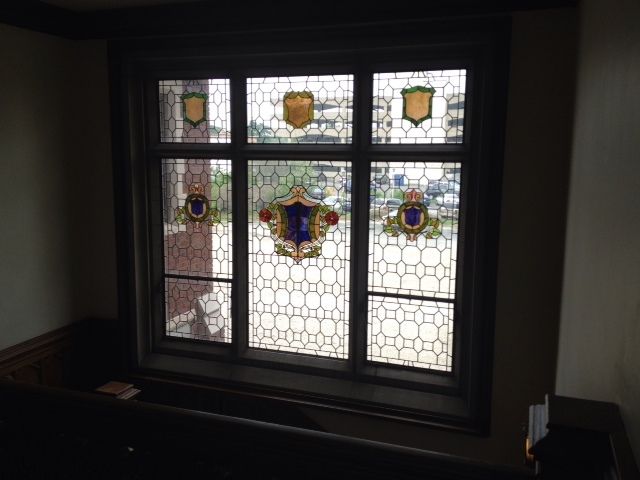 The second phase of the job involved producing a pair of framed panels that would fit under the window sills of the north wall. Originally, these alcoves most likely housed radiators. The alcoves probably housed radiators, but those had been removed long ago. 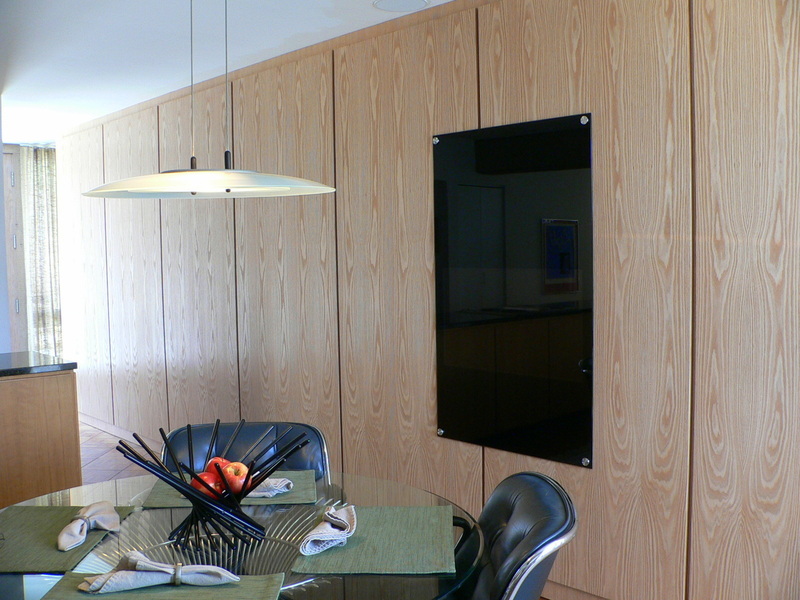 Mark Dollase thought the room deserved to have its panels continue all the way around. I have to agree, especially now that I have seen the room come back to life. Before fitting the panels, we insulated the exterior wall and installed furring strips. 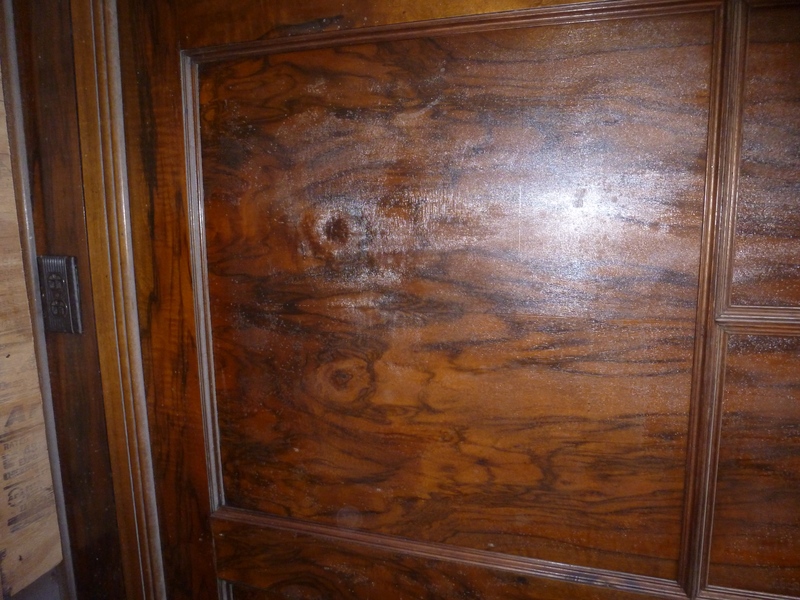 For the frames and trim I used Circassian walnut, though I was not able to find any with the dramatic dark veining that characterizes the dining room’s original woodwork. I had to grain that in. 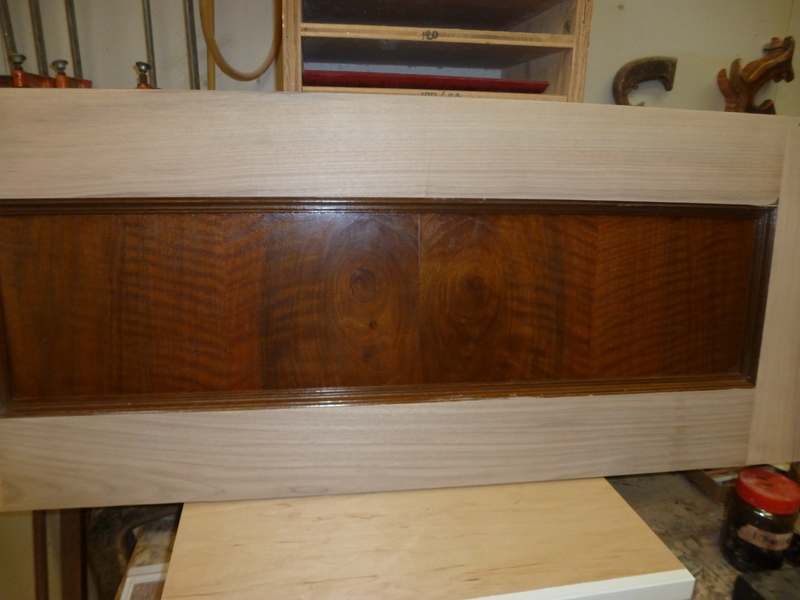 This (the bare frame) is what the walnut looks like before finishing. Really. 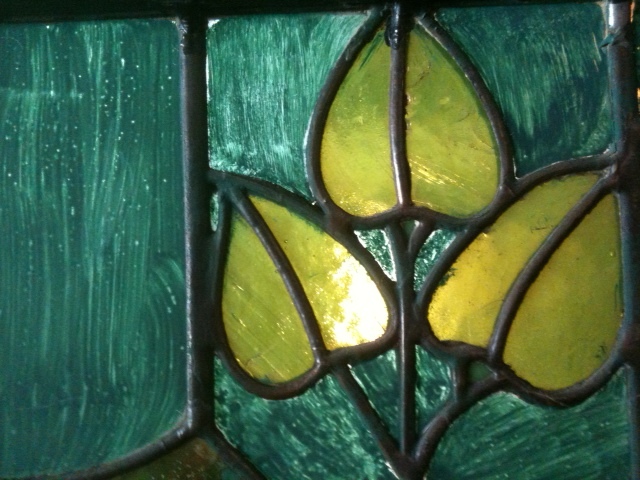 In this shot the panel has its basic finish but has not been grained or topcoated. 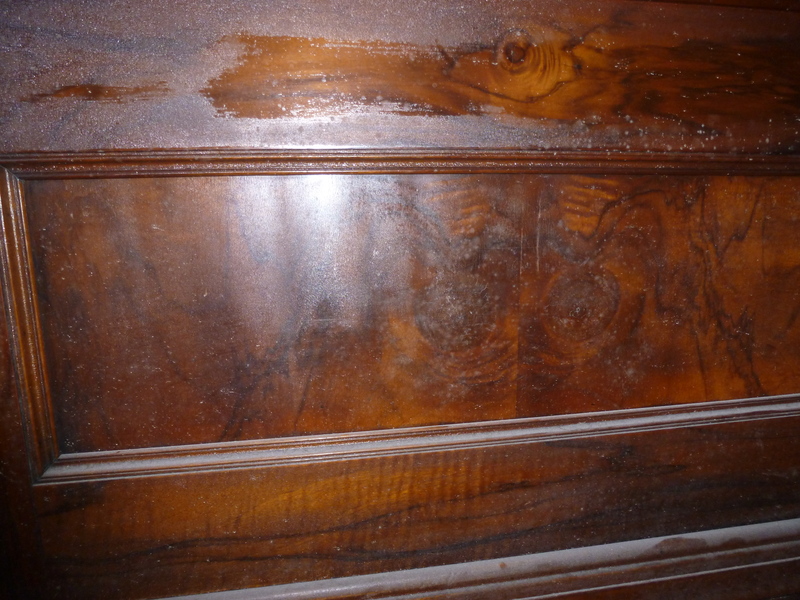 Investigation revealed that every flat surface of the original woodwork was veneered with walnut from the same tree; hence the consistency of the grain and tone. 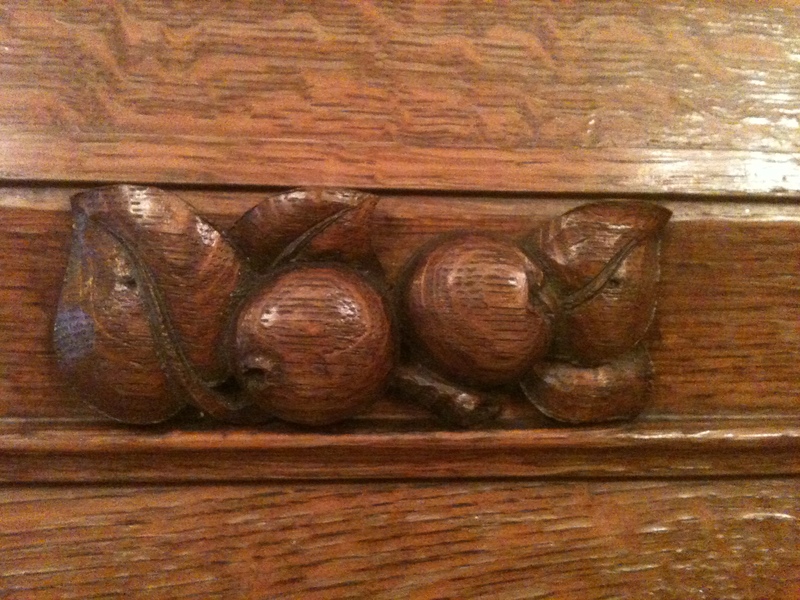 Moldings were made from less highly figured solid walnut. I had the panels* veneered in Circassian walnut by Heitink Veneers, whose craftsmen, at my request, took the care to create an owl’s face very much like the owl’s face that appears in the lower part of each original panel. The owl, a favorite Arts & Crafts motif that was presumably intentional, appears first at the formal entry and continues around the room. 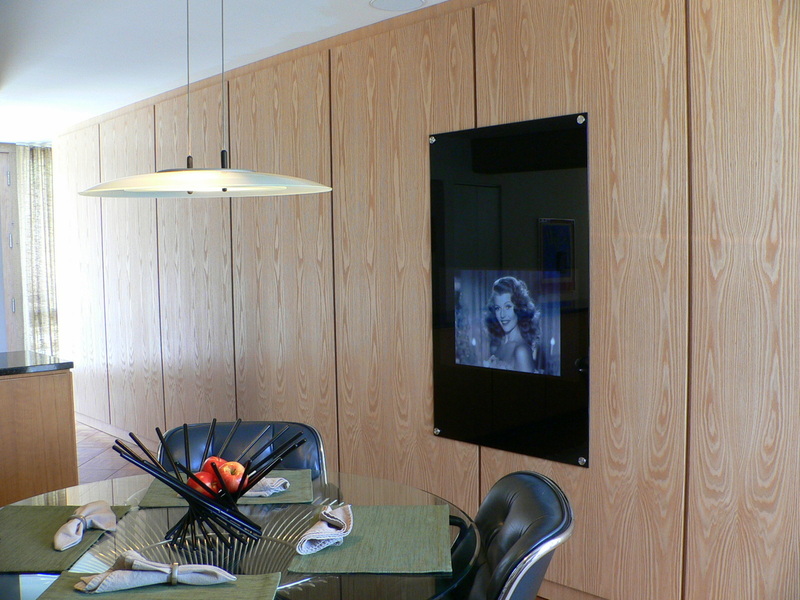 Admittedly, since wood veneer is a natural product, the face changes with each successive panel. By the time you get back to the doorway, the face looks more like a turkey. 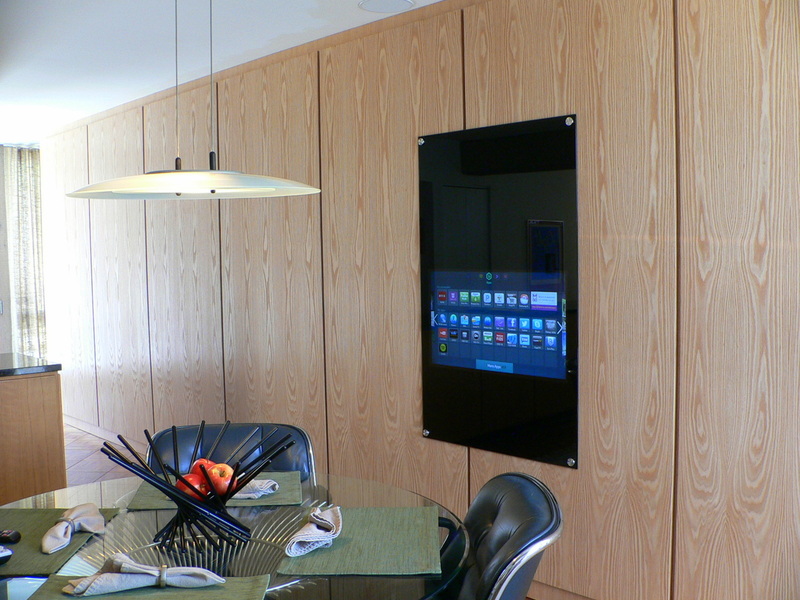 *The panel referred to here is the flat expanse set within the framework. Indiana Hardwood Mills reproduced the panel molding, which lines the inside edge of the frame, and the top section of the baseboard. Both are visible in the photograph above. After several experiments I landed on a finishing system that brings out the tonal variation and vibrancy of the original walnut; although I could have come close using techniques I’ve had up my sleeve for years, I got closer thanks to an additional trick learned during a finishing workshop with Peter Gedrys. As for the veining…well, let’s just say that after weeks of worrying, I’m relieved to have pulled it off. 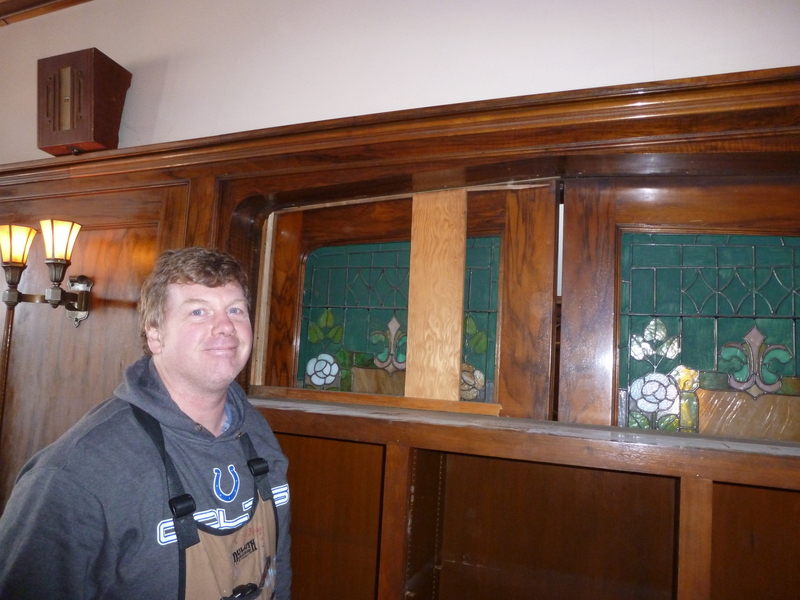 One of the new panels with its new baseboard and shoe molding. 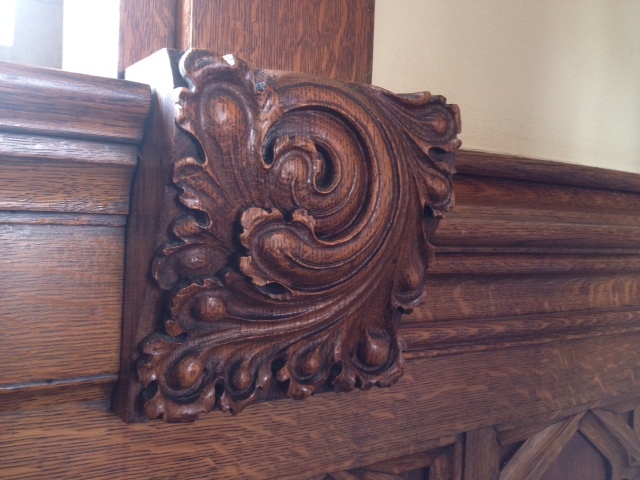 The surrounding moldings and pilasters are original; although their finish has been somewhat marred by exposure to moisture and sunlight–hence the low sheen relative to the new panel, which is closer in sheen to the original finish in undamaged areas–it is quite glorious. By the time the house was donated to the Indiana Landmarks Foundation, another medical building had been appended to the north side. That structure has been removed. 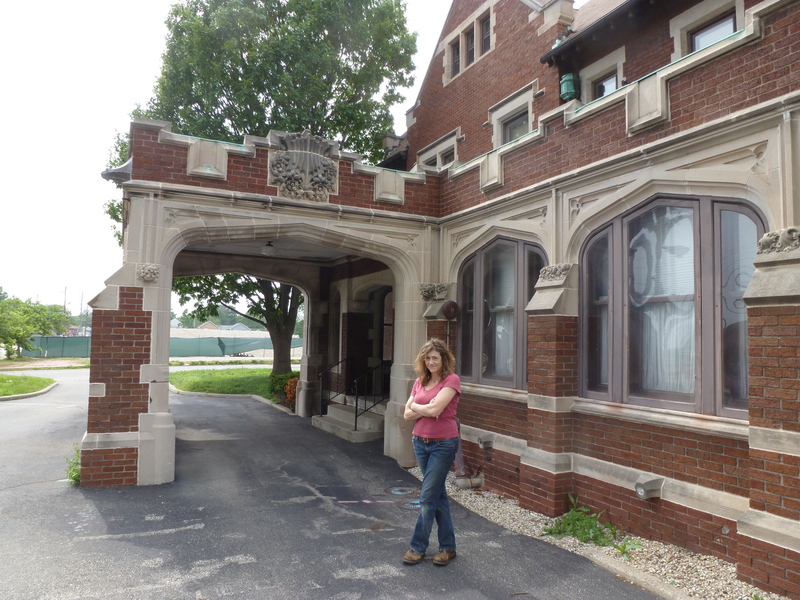 The Glossbrenner Mansion is filled with architectural wonders. Following is a tiny selection. 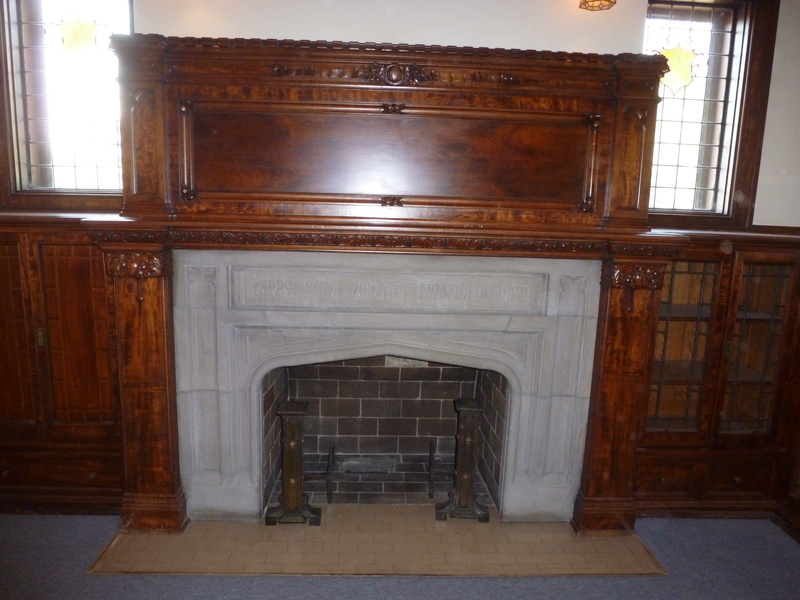 The fireplace in the main living room extolls the virtue of friendship. Faux grained to the max. 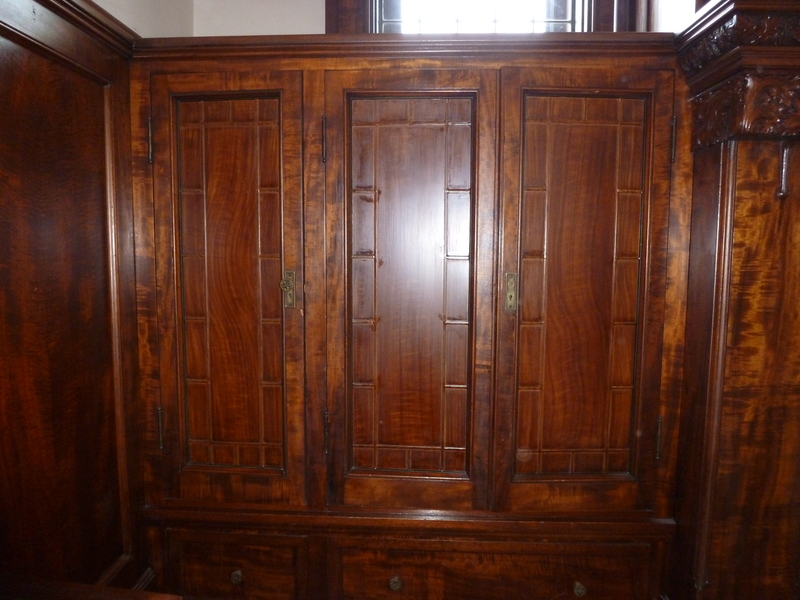 These doors are not wood, but leaded glass, painted to match the surrounding woodwork in order to conceal the cupboard’s contents. Though not original to the house, this paintwork is the work of a highly skilled craftsperson. 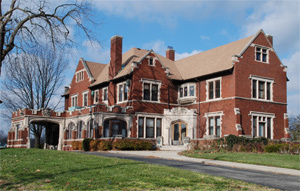 The Walther Cancer Foundation donated the 1910 Glossbrenner Mansion to Indiana Landmarks to guarantee its preservation. Landmarks plans to market the property in the near future. 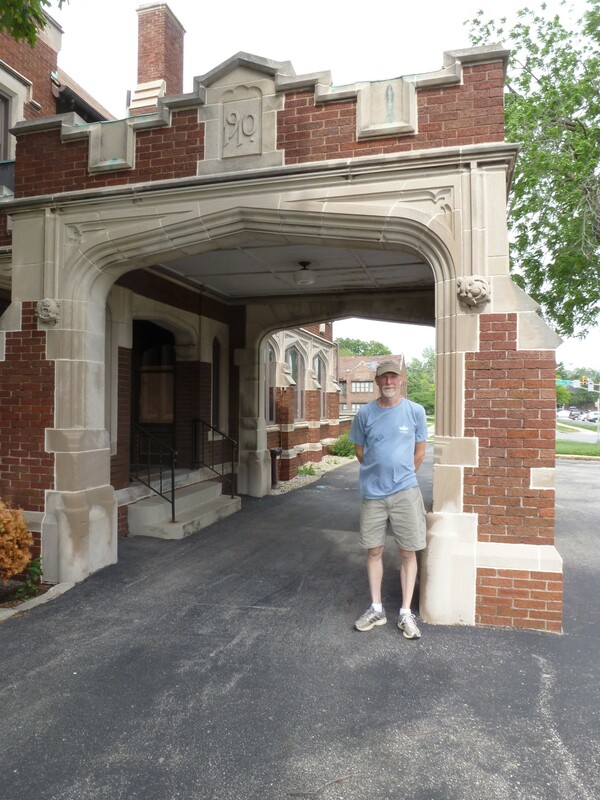 For information, contact Mark Dollase, Vice President of Indiana Landmarks Foundation. 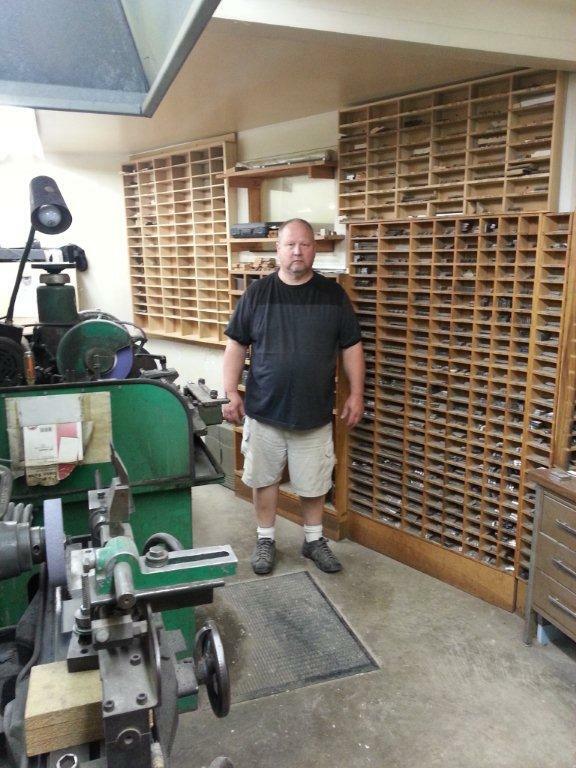 My partner Mark Longacre of Mark Longacre Construction, Inc. 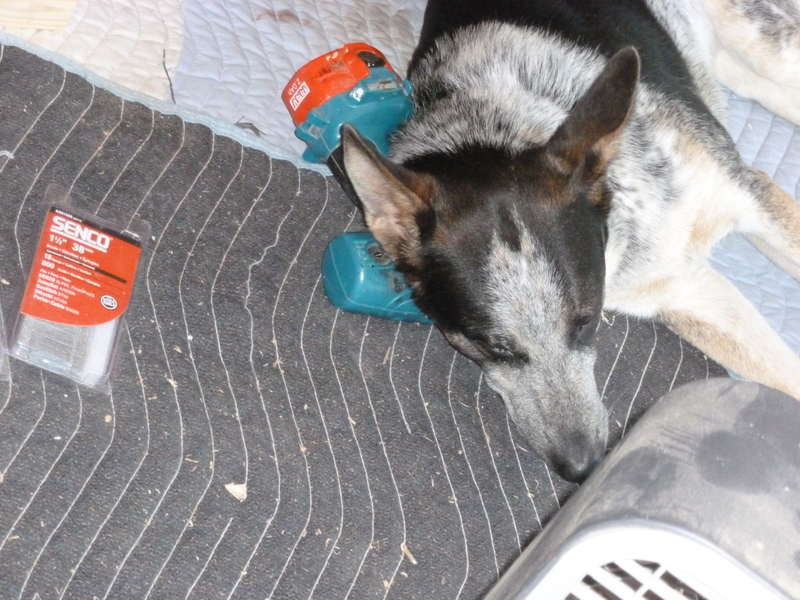 The desperate use of a drill as a pillow suggests that some people are not amused by the proceedings.